In Carousell listings put up by user @maid.recruitment, the faces of several maids, allegedly from Indonesia, were posted. Some of the profiles even indicate that the maids have been "sold". SINGAPORE – The Ministry of Manpower (MOM) is investigating cases of maids being “sold” on online retail platform Carousell. In a Facebook post on Friday evening (Sept 14), the ministry said that it is “aware of cases where foreign domestic workers are being marketed inappropriately on...Carousell”. “We are investigating these cases, and have arranged for these listings to be taken down,” it added. 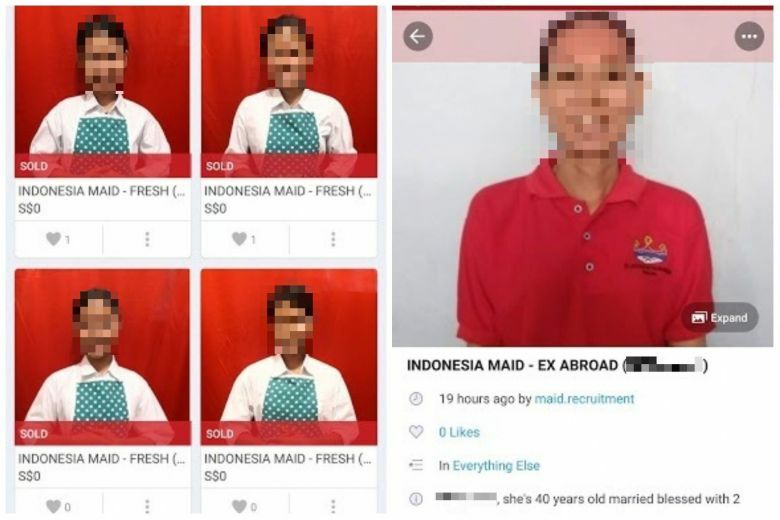 In listings put up by user @maid.recruitment, the faces of several maids, allegedly from Indonesia, were posted. Some of the profiles even indicate that the maids have been “sold”. In response to queries from The Straits Times, a Carousell spokesman said that such listings are not allowed on the marketplace in accordance with its community guidelines. While it allows agencies to advertise services, personnel listings are not allowed. “Any display or sharing of individuals’ personal biodata is strictly prohibited, as this violates our guidelines,” Carousell’s spokesman said. They added that there was no actual sale transacted and such a sale would be removed from the marketplace if detected. “In this instance, we are assisting the authorities with their investigations,” the spokesman added. Carousell also said that it has since suspended the account and removed the listings. In its post, the MOM said that advertising maids like commodities is unacceptable and an offence under the Employment Agencies Act. If found guilty under this law, an employment agency can face demerit points and have its licence suspended or revoked. “MOM expects employment agencies to be responsible and exercise sensitivity when marketing their services,” it added. MOM said that it is also a serious offence to conduct employment agency activities without a valid licence. Offenders can be fined up to $80,000, jailed up to two years, or both. Anyone who uses the services provided by an unlicensed employment agency can also be fined up to $5,000. The Carousell spokesman said that this is the first of such listings the online marketplace has come across. MOM advised the public to use only MOM-licensed employment agencies, and to check if an agency is registered and legal at www.mom.gov.sg/eadirectory.